To fully decommission a power plant, the facility must be deconstructed and the site returned to greenfield status (meaning the site is safe for reuse for purposes such as housing, farming, or industrial use). Nuclear reactor operators must safely dispose of any onsite nuclear waste and remove or contain any radioactive material, including nuclear fuel as well as irradiated equipment and buildings. Decontamination (DECON) is the relatively faster method of decommissioning a nuclear reactor and involves removing all fuel and equipment from the power plant. The fuel and equipment represent the bulk of the irradiated material on the site and are removed for separate storage and decontamination. DECON can take at least seven years and allows for the relatively quick return of the land for reuse. Safe Storage (SAFSTOR), also known as deferred dismantling, involves containing and monitoring the reactor and equipment until radiation drops to safe levels. The SAFSTOR timeline allows for up to 50 years of containment followed by up to 10 years for decontamination. The longer timeline of the SAFSTOR method can allow some radioactive contamination to decay to safe levels, reducing the amount of radioactive material that must be disposed of, which can reduce the total decommissioning cost. Operators also have more time to secure funds to pay for the decommissioning process over the longer timeframe of the SAFSTOR process. A third technique, known as ENTOMB, involves permanently entombing the entire site in concrete. This method is not used for commercial reactors in the United States, but it has been used in other countries. For example, the Chernobyl 4 reactor in Ukraine has been entombed in a steel shelter designed to prevent radiation leaks from the site. Decommissioning strategies are typically based on the amount of contamination on site, how easy it is to remove irradiated material, and the cost to remove equipment versus decontaminating it onsite. Operators may also chose to implement both methods, using DECON to quickly dismantle and decontaminate part of the facility, while other parts are left for SAFSTOR. In both cases, operators currently must also store spent nuclear fuel onsite, either in cooling pools or dry casks. The decommissioning process is paid for through a fund that each plant operator creates during construction. According to the World Nuclear Association, about two-thirds of the total estimated cost of decommissioning all U.S. nuclear reactors has already been collected. However, when reactors are retired earlier than planned, shortfalls in funding may result in additional expenses to electric ratepayers. 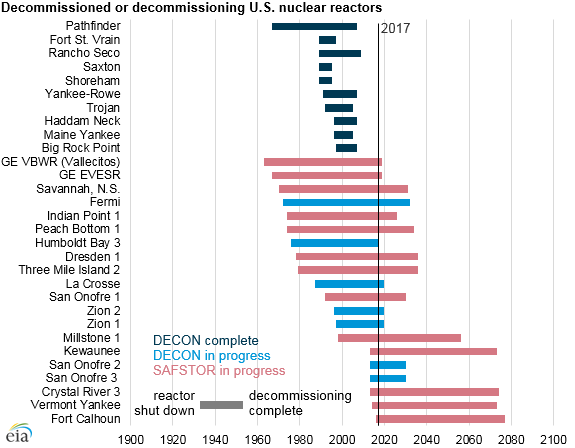 The decommissioning process is considered complete when the U.S. Nuclear Regulatory Commission (NRC) determines that the dismantlement has been performed according to the plan submitted by the operator at the beginning of the decommissioning process. A final radiation survey must demonstrate that the reactor facility and site are suitable for release. One of the most recently decommissioned reactors in the United States is the 619 megawatt (MW) Haddam Neck plant in central Connecticut, which was shut down in 1997 and decommissioned using the DECON method. Haddam Neck’s decommissioning was completed in 2007 at a total cost of $893 million. More recently, the 556 MW Kewaunee Nuclear Power Plant in eastern Wisconsin was shut down in 2013. Kewaunee’s operator, Dominion Power, anticipates nearly $1 billion in total costs using the SAFSTOR method and estimates that work will not be complete until 2073. 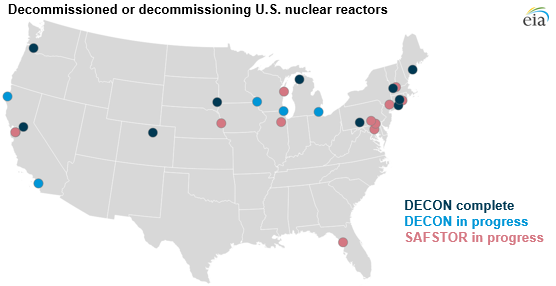 More information about decommissioned nuclear power plants in the United States is available through the NRC's web page on Decommissioning of Nuclear Facilities.